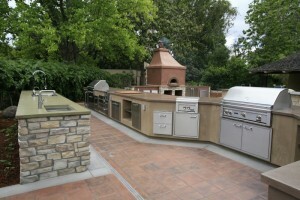 The hottest trend in kitchen design featuring a complete outdoor kitchen installment in Sunset’s “backyard”. The Sunset Outdoor Kitchen provides a stunning outdoor cooking and entertaining venue. Designed with extensive counters and open prep space, the kitchen features gas and charcoal grilling, rotisserie and wok stations. The kitchen also offers traditional open hearth wood-fired cooking enabling the preparation of everything from pizza to chicken. A wine tasting bar and beautiful patio area with fire pit complete this very Western lifestyle experience. The firepit has served as a prototype for a residential unit that is now available. Contact Mark for more information. Inspired by frequent travels to Korea, a client in Monterey, California hired architect Dennis Hodgins to replicate a Korean bathhouse as her guest house. 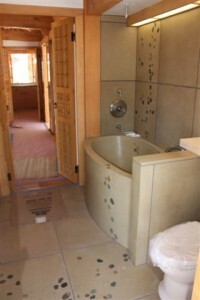 He collaborated with Mark Lesnick, founder and owner of Mark Concrete to take the project from a vision to reality. The custom project included an Asian soaking tub, concrete wall and floor tiles, and a concrete sink.The authenticity of the project was heightened with the input of various people flown in from Korea to help design and build the guest house.